Note: There are two versions of this program on the same DVD: 90-minutes and 60-minutes. In the digital age, half of our electricity still comes from coal. DIRTY BUSINESS reveals the true social and environmental costs of coal power and tells the stories of innovators who are pointing the way to a renewable energy future. Guided by Rolling Stone reporter Jeff Goodell, the film examines what it means to remain dependent on a 19th century technology that is the largest single source of greenhouse gases. Can coal really be made clean? Can renewables be produced on a scale large enough to replace coal? The film seeks answers in a series of stories shot in China, Saskatchewan, Kansas, West Virginia, Nevada and New York. The film features amongst others: Robert Kennedy Jr., Bill McKibben, Dr. James Hansen, Myron Ebell, Don Blankenship, Joe Lovett, Maria Gunnoe, Dr. Vaclav Smil and Dr. Julio Friedmann. "Dirty Business is a dramatic reminder of where our electricity comes from and of the enormous environmental and human price we pay for cheap energy. This compelling documentary drives home the point that 'Clean Coal' is a cynical advertising slogan and political tool aimed at maintaining the primacy of King Coal and pushing cleaner, safer energy alternatives to the side. Dirty Business also demonstrates how coal mining and burning disrupts and degrades communities and ecosystems, from the coal-producing regions of Appalachia to coal-consuming areas of Nevada and China. Dirty Business is a must-see for anybody concerned with our environment and energy future." "Impressive, scientifically accurate and interesting...Dirty Business does an excellent job of explaining that, while removing carbon dioxide from coal emissions is technically possible, it is a project of such vast proportions that it is unlikely to be successful in the long run...The fact that the coal industry can spend millions of dollars on advertising and that there is no equivalent counter weight to the self-serving misinformation being distributed is a very significant factor in the energy debate. We need more and better sources of information, for example this film, available and prominent in the public's awareness...I will definitely show this film to both of my environmental science classes and I am sure the film will generate a lively class discussion and give students ideas for follow up research." 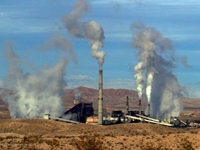 "Dirty Business provides a comprehensive look at the pervasive presence of fossil fuels and electrical power in all aspects of modern life...[and] demonstrates how the concentrated power of the coal industry holds us all hostage at a time when we need to be seeking innovative, sustainable energy alternatives, including increased efficiency, wind, solar and even recycled heat from already existing manufacturing plants. Dirty Business investigates what the coal industry means by clean coal...and demonstrates the inherent contradictions in the term. With a clear eye on the connections between political power and the electrical grid, the film maps the difficulties we face in pursuing a sustainable energy economy." "Dirty Business provides a multi-faceted examination of energy development, use, and waste disposal worldwide...Because it makes such an effort to present all viewpoints, the information provided is much more credible than most films on this topic. The movie would be an exceptional classroom tool because it describes the viewpoints of energy developers, energy users, and the people who live near extraction and waste disposal sites. Legislators, researchers and students in energy and environmental policy courses would find this film to be an eye opener. I have been teaching energy and environment policy for several years, but have never shown a film in class due to the strong bias usually present. I will definitely use this film the next time I teach the course. It is the best film I have seen on the topic." "Dirty Business exposes the reality of the modern human's reliance on coal, 'the rock that built America' that will now build China and other rapidly industrializing nations. That is, if it does not break us all, first...An informed, holistic view of our energy use that will help us to make better decisions for the future...[and] gives credible consideration to alternative energy sources while also looking at sequestration technologies to treat emissions...Dirty Business captures the complexities of human reliance on electricity and the coal that makes it possible. It is a balanced primer on the role of energy modern life that will be an excellent addition to the environmental studies curriculum at any high school or college." "Most people don't realize the amount of coal burned to provide them with electricity. This powerful documentary examines what it really means to be dependent on coal...The film embraces a wide variety of topics, making it suitable for use in science, economics, and government classes." "This film separates the rhetoric from the reality...It explains that clean coal is not yet an energy source; it is just an untested idea. It compares clean coal with proven technologies such as wind power, solar power, and waste energy recovery...Unlike some environmental films, it gives a reasonable amount of screen time to the other side of the story. And while it thoroughly explores the negative impacts of coal-powered energy, it also introduces positive solutions." "The best and most comprehensive look at global dependence on coal, and explores some promising alternatives...wind, solar thermal, increased energy efficiency through recycling 'waste heat'--which makes this a valuable resource for science as well as social studies classes...Dirty Business is a fine and lively overview of a complicated issue." "With most of the attention centered on oil, natural gas, and alternative forms of energy, the documentary film director Peter Bull has done a great service by focusing on coal: a widely used, enormously impactful, but far less glamorous form of energy...The visuals of the impact of mountain top removal are stunning as is the suffering of the people who must live with its aftereffects." "Dirty Business reminds us of the sobering costs of coal-generated electricity, dramatic vistas of communities devastated by mountain-top-removal mining, and surreal images of Chinese cities through a coal pollution haze. Especially interesting was the footage of current and historic interviews with Don Blankenship, CEO of Massey Energy Co., the 6th largest coal company in the U.S. and operator of the Upper Big Branch, which killed 29 Kentucky miners in an April 2010 explosion. The icing on the cake is the outtake during the credits to the film: Blankenship abruptly terminates his interview." "A sober examination of the industry that currently provides half of America's electrical power...Coal power comes with heavy societal and environmental costs, and is the largest single source of greenhouse gases; can it really be made 'clean' in a sustainable, long-term sense?...Dirty Business looks for answers...and its eye-opening revelations make it a choice pick for public and school library DVD collections." "This straight-shooting documentary takes a skeptical but judicious look at the future of coal-based energy...Fact-filled...Viewers get a sobering look at the damage strip mining and mountaintop removal are doing." Includes 90-minute and 60-minute versions, and a 15-minute short "What is Clean Coal? ", all with scene selection and SDH captions for the deaf and hard-of-hearing.